Malaysia is usually described as a melting pot of people from various backgrounds. The population in Malaysia consists of an interesting mix of Malay, Chinese, Indian, Eurasian, Sikh, Iban, Kadazan, Peranakan and other ethnic communities. Despite the mélange of cultures and traditions, all Malaysians are still united because they have the qualities of mutual respect and tolerance. The spectrum of traditions, festivals and cuisines have proven the diversity of cultures in Malaysia. Albeit the official national religion in Malaysia is Islam, however, other religions are still practiced freely. Every Malaysian has their right and freedom to practice their own religion. For instance, other religions like Buddhism, Taoism, Hinduism, Christianity, Sikhism and other faiths are practiced. Many places of worship have been highlighted due to Malaysia’s multi-racial population for decades. Mosques, Buddhist and Taoist temples, Indian and Sikh temples, Thai wats and churches of different denominations dot the streets of Malaysia. What is more interesting is that it is not impossible to find various religious houses attesting to different faiths within the same area. There are places where a mosque, Buddhist temple, Hindu temple, a church and Sikh temple co-exist on the same street, if not side by side. Correspondingly, with so many cultures co-existing in harmony within its shores, Malaysia also naturally boasts a myriad of festivals celebrated throughout the year. The major festivals are Aidilfitri, Chinese New Year, Deepavali, Christmas, Vasakhi, Gawai Dayak and Tadau Ka’amatan. Islamic Civilisation Park is known as Taman Tamandun Islam among the locals. In the Islamic Civilisation Park, there is one beautiful Crystal Mosque. Crystal Mosque was built with steel, glass and crystal, hence the name. This grand building sits over Terengganu River and welcomes over 1500 worshipers at a time. The view during the day is beautiful with the sun shining over its glass faceted exterior, giving the sparkling effect, while the view during the night is shown as below. The Kek Lok Si Temple (simplified Chinese: 极乐寺; traditional Chinese: 極樂寺; Pe̍h-ōe-jī: Ki̍k-lo̍k-sī; Penang Hokkien for “Temple of Supreme Bliss” or “Temple of Sukhavati”) is a Buddhist temple situated in Air Itam in Penang and is one of the best known temples on the island. It is said to be the largest Buddhist temple in Southeast Asia. Mahayana Buddhism and traditional Chinese rituals blend into a harmonious whole, both in the temple architecture and artwork as well as in the daily activities of worshippers. The Kek Lok Si is very beautiful as shown in the photo below. LED lights beautify the whole Kek Lok Si during the night time. It only happens for 15 days from the 1st -15th day of January of Lunar Calendar. The Thean Hou Temple (Chinese: 天后宫; pinyin: Tiānhòu gōng; Pe̍h-ōe-jī: Thian-hiō-kiong) is a landmark six-tier Chinese temple in Kuala Lumpur. It is located in a 1.67 acres (6,760 m²) of land atop Robson Heights along Lorong Bellamy, overlooking Jalan Syed Putra (Federal Highway). It was completed in 1987 and officially opened in 1989. The property belongs to and is run by the Selangor & Federal Territory Hainan Association (Persatuan Hainan Selangor &Wilayah Persekutuan). The temple, built by the Hainanese community living in Kuala Lumpur, is dedicated to GoddessTian Hou (The Heavenly Mother). Same as Kek Lok Si, The Thean Hou Temple is decorated with LED lights during Chinese New Year. Batu Caves is a limestone hill that has a series of caves and cave temples in the Gombak district, 13 kilometres (8 mi) north of Kuala Lumpur, Malaysia. It takes its name from the Sungai Batu or Batu River, which flows past the hill. Batu Caves is also the name of a nearby village. You will be surprised because your arrival at Batu Caves will be greeted by lots of monkeys. They are going after your peanuts and bananas, which you can buy from several shops before you climb up to the caves. After climbing 272 steps, you will be able to see the religious and magnificent Batu Caves. The photo below show the night view of Batu Caves. 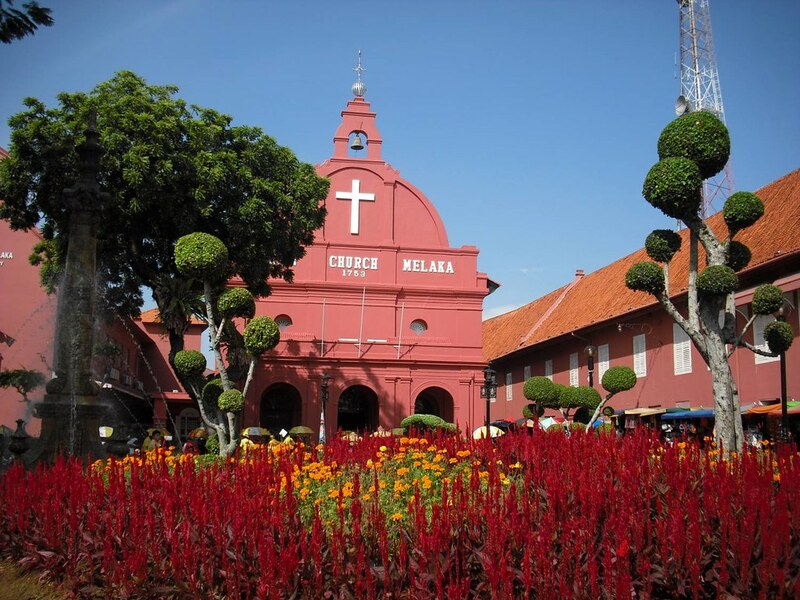 Christ Church was built by the Dutch when they took possession of Malacca from the Portuguese. It is one of Malacca’s most defining structures. Situated along Jalan Gereja (also known as Church Street) it is an instantly recognizable brick-red building with a huge white cross at the top. The interior of the cathedral has 200 year-old handmade pews, decorative fanlights and plaques that honour Dutch soldiers and locals. Gurdwara Sahib Sikh Temple is a temple on Jalan Masjid in Kuching. 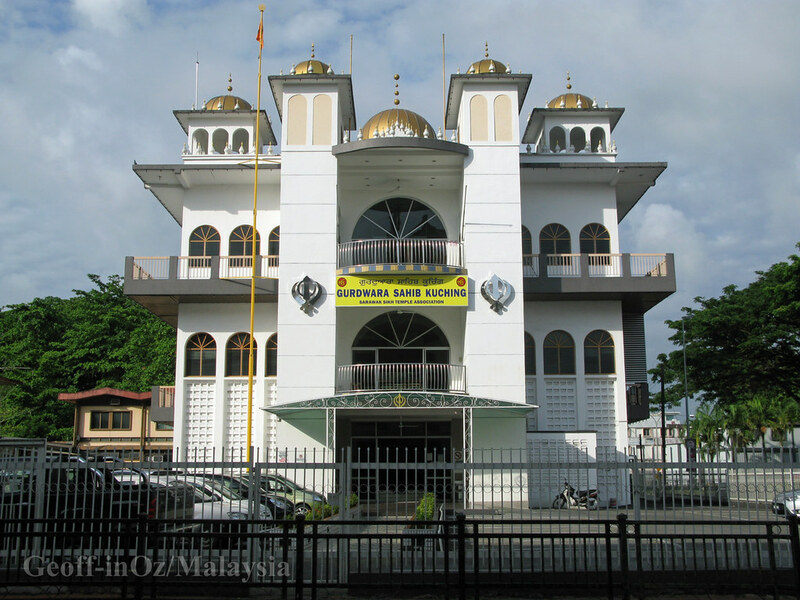 It is one of the few places of worship for the Sikh community in Kuching, and was established by the Sikhs who came to work in the police force during the British administration.